Now that Obamacare's first open enrollment has come to a close, CNNMoney looks at the numbers. Things were looking pretty grim when Obamacare launched on October 1. The exchange websites didn’t work, and internal notes showed that only 6 people signed up initially. The Obama administration had to bring in a SWAT team of tech experts to overhaul the federal exchange site. What a difference six months makes. More than 7.1 million Americans have selected policies on the state and federal exchanges, with the big push coming just before open enrollment closed March 31. Though it remains to be seen how many of these applicants will pay their premiums and fully enroll, Obamacare has a shot of hitting Congressional Budget Office original projection that 7 million people would enroll for 2014. 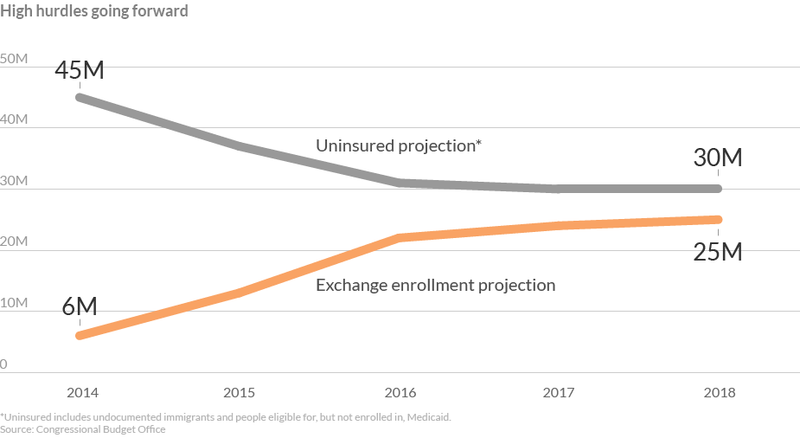 But that remains a relatively small share of the people who could sign up for coverage in the exchanges. They include the millions of Americans who are uninsured or had bought coverage on the individual market before. Some states are doing better than others in signing up their residents who need insurance on the individual market. Many of those leading the way are states running their own exchanges, which are more supportive of Obamacare and are pouring additional money into getting people to sign up. Young folks are signing up for Obamacare, but not in the numbers some experts had expected. Attracting young adults is an important factor in Obamacare’s success because they are generally healthier and less expensive, thus offsetting older Americans, who will likely run up bigger bills. Just how many young people are needed is a matter of debate. What about 2015 … and beyond? The push to sign people up for Obamacare won’t end on March 31. It begins all over again November 15, when open enrollment starts for 2015. And the bar will be much higher in coming years. Yet, even if tens of millions of people eventually sign up for Obamacare, tens of millions more will remain uninsured. Many will be undocumented immigrants and those living below the poverty line in states that didn’t expand Medicaid. The Obama administration may let people who run into difficulty applying before the March 31 deadline more time to finish their enrollment. Time is running out to sign up for individual health insurance. And if you don't have some type of coverage this year, be prepared to pay a penalty. A new McKinsey survey shows the number of uninsured Americans signing up for coverage under Obamacare is growing, but the number remains low. Many Americans are having a tough time finding doctors or hospitals who will accept their Obamacare insurance.